local mum has launched an online petition calling on South Gloucestershire Council to install a zebra crossing on Brook Way, between its junctions with Merryweather Close and Dewfalls Drive. Esther Huke says the current uncontrolled crossing point at this location is dangerous to use because the road is very busy, particularly during the times of the ‘school run’, and vehicles do not stop to allow people to cross. Thinking of re-mortgaging? We understand that mortgaging your property can be a balancing act. Why not tip the scales in your favour with our access to thousands of competitive rates and deals? We do not charge for our advice. Instead, we simply charge a fee when you receive your mortgage offer. Our typical fee is £295, but will depend on your circumstances. Your home may be repossessed if you do not keep up your mortgage repayments, or other debts secured on it. You may have to pay an early repayment fee to your lender should you re-mortgage. one occasion when a car was approaching a speed and she wasn’t sure it was going to stop. She also points out that it is not just schoolchildren and their parents who are at risk as the crossing is used by many elderly and disabled people throughout the day. Although her petition calls for a zebra crossing to be installed, she says that a light-controlled crossing would be preferable. A raised table crossing, like the one further up Brook Way near the Wheatfield Drive junction “wouldn’t really help as you still need to wait for cars to stop”. The petition has been advertised in the Wheatfield Primary School newsletter and on the ‘friends’ Facebook page. It was also scheduled to be discussed at a meeting of Bradley Stoke Town Council’s planning committee on 27th March after a councillor became aware of it via a Facebook post. 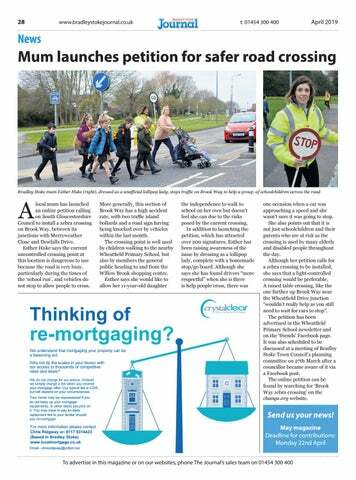 The online petition can be found by searching for ‘Brook Way zebra crossing’ on the change.org website. 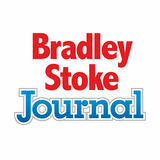 April 2019 issue of the Bradley Stoke Journal news magazine.